Tag Archive | "Occidental Mindoro"
It had a scorching heat that day. 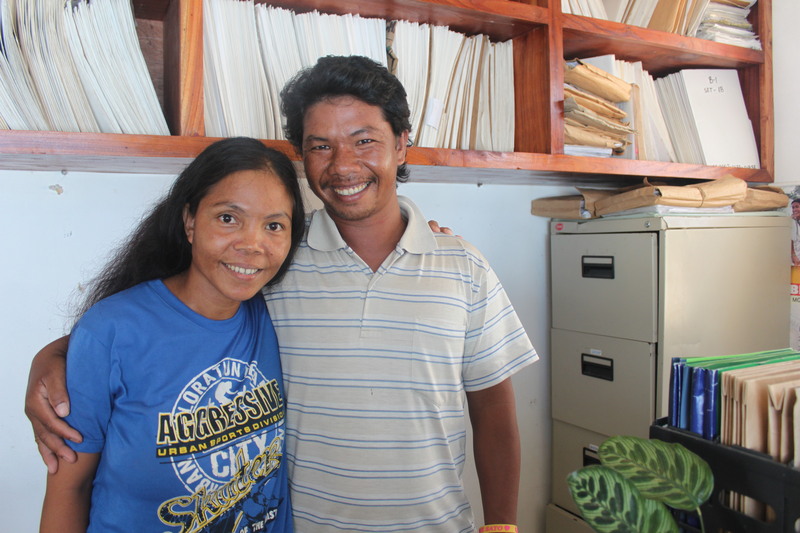 Arthur, 33, and Jennelyn, 32, were inside the municipal office of Pantawid Pamilya, silently waiting. Reluctant at first, the couple showed little of their smiles. But as asked gently and pushed deeper, the goodness of their hearts emanate. Little by little the Masalansan family from Sta. Cruz, Occidental Mindoro recounted the changes in their lives since they became part of Pantawid Pamilya in 2008. Living in a mountain is difficult. The Masalansan family attests to that. Relying on ‘kaingin’, a method of clearing land by slashing and burning bushes for cultivation, is not enough to earn for your family. Also, not owning lands to tend as farmers, Arthur and Jennelyn have to constantly rent to plant crops and with that alone diminishes the earnings they get to pay the landlords. Before becoming part of Pantawid Pamilya, the family lived in walls sewn in sacks of rice or “tagpi-tagping bahay” as what they call it, making it more difficult for everyone especially during rainy season. They also do not have water source in their own home. They have to walk for almost 500 meters to get to their neighbor with a water pump. It was like that for the family for many years until aid came. The group where the Masalansan belongs is the Mangyan-Alangan. They resisted the assessment of the enumerators in 2008 since they have long history of protecting their domain from prospective mine conglomerates. Arthur recalls that Jennelyn together with the ‘Kuy-ays’ or elders from the tribe stopped the DSWD staff before and demanded to show proof that it is a trusted program in fear of letting mining enter their area. True to their intentions, the program proved to help the people in need in their area and the Masalansan being included. The cash grant that they receive provided support to the family. It did not fully answer to their overall financial needs but it can afford the needs of the children. The positive impact it brought to them that even Arthur smiles when remembering it is that they were able to give additional food or allowance to their children when they now go to school. He further said that sometimes their children would be just satisfied looking at the food stalls and they weren’t able to eat merienda like ‘banana cue’. But now, they are able to give at least 20 pesos. Arthur’s faced lit up and considered it a big deal for them. Sometimes, since they can now provide rice for their children, their allowance is allotted to buying viand at school. When they have enough, the family is able to save. But they ensure that they have enough for their children. Jennylyn shares that they now are also able to buy multivitamins for the kids. It not only the cash grants that the family is grateful for. It is also because of Pantawid Pamilya that the family was able to receive the Self-Employment Assistance – Kaunlaran (SEA-K) or what is now called the Sustainable Livelihood Program (SLP). SEA-K aims to enhance the socio-economic skills of poor families through the organization of community-based associations for entrepreneurial development. The prioritized beneficiaries of the then SEA-K are the Pantawid Pamilya beneficiaries. This is to assist the upliftment in the level of well-being of the beneficiaries from survival to self-sufficiency. The Masalansan was one of the families who were granted a capital. They received a capital of 7,000 pesos and they were fortunate that Arthur’s brother-in-law offered his land to till for free. Arthur could not be more than grateful and thought that luck was really on their side. They do not have to pay for the rent of the land so when the harvest came, they got the earnings in whole. He bought seeds of corn for 5,000 pesos and another 2,000 pesos for the fertilizers. But the capital was not enough. “Nagtrabaho pa po ako sa labas, yung arawan po kaya nakaipon pa po ako ng 1,000 at yun po ang binili ko po ulit ng abono,” narrated Arthur. The Masalansans received the earnings of their harvest in full. They earned at around 30,000 pesos. They saved the 20,000 pesos and used it to repair their house. They are able to cement the half of their walls even just a small portion. “Kahit maliit lang, hindi na tulad ng dati na ang bubong namin ay kugon. Mahirap po kasi ‘pag umuulan,” told Arthur. For them, it has brought them a big change and motivated them to work more and better themselves. The remaining 10,000 pesos from their first harvest were allotted for buying rice crop since it is a different planting season. Since they cannot use his brother-in-law’s land, the couple found another land they could rent. The portion was given to the land’s rent while the remaining 8,000 were allotted for the seeds and fertilizers. While the family is doing this, they are still doing ‘kaingin’ to sustain the expenses of the family. “Sa amin naman po kasi, makapagbenta ka ng saging, may pambili ka na ng asin. Pag may talbos ka, may ulam kana,” added Nanay Jenelyn. The hard work of Jennelyn and Arthur paid off. They were able to earn big and saved up 10,000 from that earning to fix their house again. “Hindi po kami magkakaroon ng ganung bahay kung hindi po dahil sa programa ng DSWD,” uttered Jennelyn. They now have a water pump inside their house and are planning to build a proper toilet. A stable home is what every family wants and the Masalansans had it. It is not grand but it serves its purpose of keeping a loving family sheltered and safe. The couple smile together with their youngest and newborn child. The Department did not only change the family in terms of financial capability but more importantly with their way of looking at life. With the help of the Family Development Sessions which Arthur and Jennelyn attend together, the couple changed their attitude towards things particularly in the health aspect for the children. “Noong wala pang pantawid, hindi po namin naiisip na kailangan manganak sa hospital. Takot po kami, takot. Pero ngayon hindi na,” said Arthur. He added that it is the culture of their parents to give birth in their own homes. “Pero ngayon, ang naiisip po namin, pag manganganak ay dapat sa ospital. Kung safe man sa bahay, mas safe dito sa clinic,” agreed by Arthur. Jennelyn tells that that they are reminded during FDS that should give birth to a hospital or a clinic that is why when they had their recent sixth child, “Kahit gabi po, humanap po kami ng sasakyan para lang makarating sa clinic at hindi tulad noon na sa bahay lang,” recounted Arthur. The lessons in those sessions change their family’s lifestyle. “Yung pagbabakuna, noong wala po yung Pantawid, takot po kami. Syempre karayom po yun. Yung magulang takot, yung bata takot din,” Arthur remembers fondly. “Dati po hindi malinis yung mga anak namin pati na rin po kaming mga magulang dahil likas po sa amin yung di po talaga kami naliligo araw-araw. Hindi nga rin po kami naghuhugas ng kamay pag kakain,” added Jennelyn. It is because of Pantawid Pamilya that the family learned to care for their hygiene and cleanliness of their surroundings. The couple also imbibed learning the rights of children. “Dun sa karapatan ng bata, wala kaming alam dun. Pag nagagalit kami, ang alam naming, pwede naming paluin. Pero ngayon, hindi na. Alam na naming pati ng obligasyon ng mga magulang,” said Arthur. Even their relationship as a couple was change positively because of attending the FDS. Arthur admitted that he used to drink a lot. Whenever he sees his friends, he will buy alcohol instead of food for the family. Arthur recalled that he was suddenly awaken. “Hindi na po ako nag-iinom. Nag-isip po talaga akong mabuti. Naisip ko, nahihirapan kami. Walang pambili ng bigas, bakit ganun? Ah kasi, binibili ko ng alak at sigarilyo,” told Arthur. “Ang pangarap ko po talaga ay makatapos ng pag-aaral ang aking mga anak. Yung magkaroon sila ng magandang buhay. Sapat na po sakin yun,” said Jennelyn. The couple doesn’t want their children to experience the life they had all throughout. They never thought that they can have a good life. And it felt good. “Lubos kaming nagpapasalamat dahil noong mula po na nagkaroon kami ng Pantawid, kahit po kami ay naghihirap na ay naitataguyod namin ng maayos ang aming mga anak. Kung noon, yung kakulangan po na hindi namin naibibigay sa aming mga anak ay ngayon po kahit papaano ay naibibigay na po naming,” said Jennelyn. “Kami ay binago ng programa ng DSWD. Nagkaroon kami ng bagong pundasyon. Kumbaga sa bahay, matatag na pundasyon na hindi kayang gibain kahit anong mangyari. Sana marami pang pamilya ang matulungan at hindi lang kami,” ended Arthur. Core shelter beneficiaries raise their land titles received from the Department of Agrarian Reform. SABLAYAN, Occidental Mindoro- With the convergence efforts of different government agencies, families who were devastated from Typhoon Jolina in 2009 received their new housing units under the DSWD’s modified Core Shelter Assistance Program (CSAP) last July 31, 2015. The Department of Social Welfare and Development (DSWD) MiMaRoPa Assistant Regional Director for Operations, Floreceli Gunio and Sablayan Mayor Eduardo Gadiano led the turn-over of 58 housing units in Sitio Yapang, Barangay Batong-buhay and 339 units in Sitio Cigaras, Barangay Ilvita during the inauguration ceremony in the municipality. Funding for the construction of the said houses was provided by the DSWD amounting to Php28 million pesos with Php12 million pesos counterpart from the local government unit with 600sqm lot granted to each family by the Department of Agrarian Reform (DAR). The core shelter units worth Php70,000 each. CSAP site in Barangay Ilvita, Sablayan is now occupied by 339 families. Houses were built by beneficiaries’ own hands. “Ginagawa namin ang mga bahay namin, sumasahod pa kami dahil sa cash for work [program] ng DSWD,” said Ilvita Barangay Captain Noel Yasay. Building of core shelters also serves as training ground for beneficiaries under the Technical Education and Skills Development Authority (TESDA) course of masonry and carpentry, on which whoever passed the assessment get National Certificate II affirming their skills competency. Furthermore, the Philippine Army has volunteered in the construction. On the other hand, the Occidental Mindoro Electric Cooperative (OMECO) and National Electrification Administration (NEA) have allocated one-million peso-fund for the electrification of the two housing sites thru their Sitio Electrification Program. The Department of Interior and Local Government (DILG) also established the Sagana at Ligtas na Tubig Para sa Lahat (SALINTUBIG) project with a mission to provide safe and sufficient water for the beneficiaries. “Dito nakita namin ang pagkakaisa ng mga ahensya ng gobyerno para mabuo ang isang komunidad,” said beneficiary Jovita Espinosa. “At itong pangrap namin na magandang bahay, na natupad na, ay aming aalagaan at lalo pang pagagandahin,” she continued. The Department of Labor and Employment (DOLE) shared Php400,000 to beneficiaries in Ilvita for employment and livelihood program under the Tulong Panghanapbuhay sa Ating Disadvantaged Workers or TUPAD while seedlings are also given for farming by the Department of Agriculture (DA). Meanwhile, the Department of Health (DOH) has released Php2, 500,000 for the construction of Barangay Health Stations. CSAP provides disaster resistant shelter units to families displaced by natural calamities that are unable to restore damaged houses. This is also intended to other families who are at high risk and vulnerable areas that need to be relocated. Carrying a child in one arm, a mother looks outside her house. She smiles as she sees a group of people approaches and says, “Magandang umaga po. Tuloy po kayo.” She lets the people take a peek of her newly-built house. Ronalyn Ebron, 34 years old is one of the beneficiaries of the Core Shelter Assistance Program (CSAP) funded by the Department of Social Welfare and Development (DSWD) together with the Local Government Unit (LGU) of the municipality of Sablayan, Occidental Mindoro. Ronalyn Ebron welcomes her visitors with a smile to their newly-built home. Ronalyn invited the DSWD staff inside her roughly decorated house. She moved to her home last January 2015. She, together with her five children and husband, used to live in Zone 4, a sitio of Barangay Ilvita, one of the areas often affected by the typhoons and flooded since they are near the river. In 2009, the said sitio received the brunt of Typhoon Jolina that damaged and destroyed properties and houses. The households living in Zone 4 are considered “at risk” for a long time and therefore pushed the local government to formulate plans for the transfer of the residents to a safer place. After systematic planning in 2013, the local government resorted to the CSAP initiated by the DSWD. With the groundbreaking ceremony attended by Sec. Corazon “Dinky” Juliano-Soliman last 2014, the LGU of Sablayan started its “Pangarap na Pamayanan” project with 397 houses for the residents of “at risk” families in barangays Ilvita and Lagnas, another area also affected by typhoons and flood. Of the total number of houses provided, 112 in Brgy. Ilvita and eight in Brgy. Lagnas are awarded to Pantawid Pamilya partner-beneficiaries like Ronalyn. As a stay-at-home mother with a delivery-man husband, Ronalyn’s family strives to do better in life. “Nagpapasalamt po kami kasi nabigyan po kami ng bahay at safe po kami dito,” utters Ronalyn. They are grateful that a sturdy house and spacious lot is provided to them and they can call it their own. CSAP is one of the contributing factors in the Department’s goal of uplifting the well-being of the partner-beneficiaries. Lina Basit shows her glee as she pose in front of her new and own home. Lina Agmat Basit, 52 years old, is also a Pantawid Pamilya partner-beneficiary. With tears, she says, “Nagpapasalamat po ako sa ating pamahalaan kasi nabiyayaan kami ng sarili naming bahay na hindi namin naisip na magkakaroon kami.” She recalled that she was excited when she heard they will receive a house from CSAP that she immediately moved to it when it was ready for occupancy. Lina also stays at home while her husband is a seasonal farmer and construction worker. For others, they don’t have much but for them, what they have is more than enough to be grateful for – their own and happy home.